2 Independent Clause A group of words that has a subject and a verb and can stand alone. Jorge is smart. The men fish and camp. 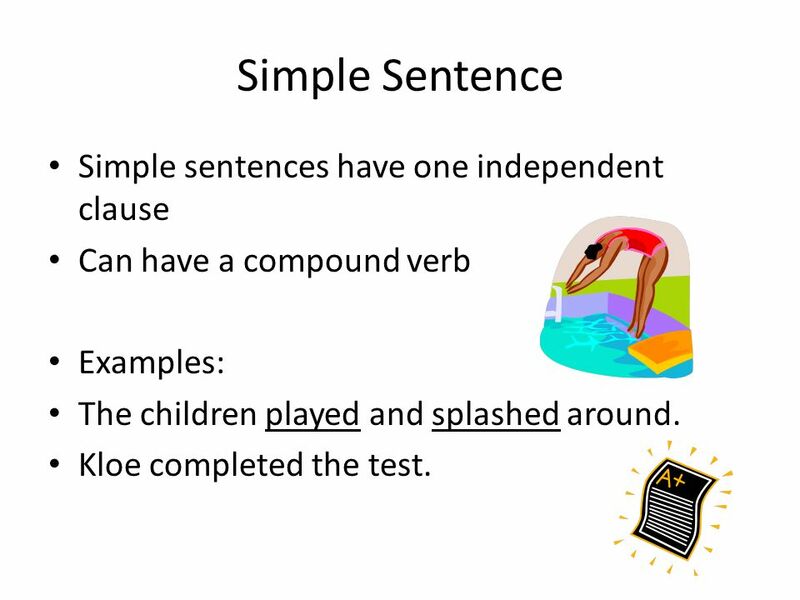 Can have a compound verb Examples: The children played and splashed around. Kloe completed the test. 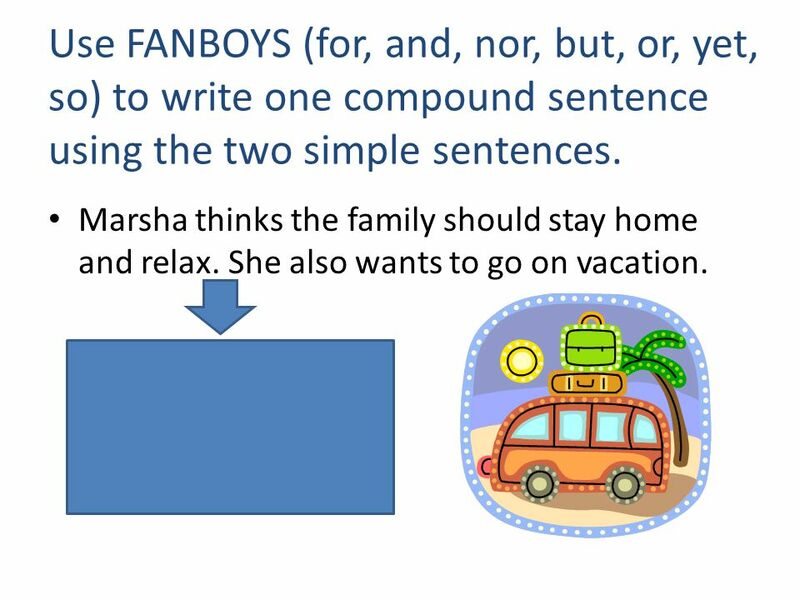 6 Use FANBOYS (for, and, nor, but, or, yet, so) to write one compound sentence using the two simple sentences. Tara didn't understand the homework assignment. She asked a friend for help. Example: Tara didn’t understand the homework assignment, so she asked a friend for help. 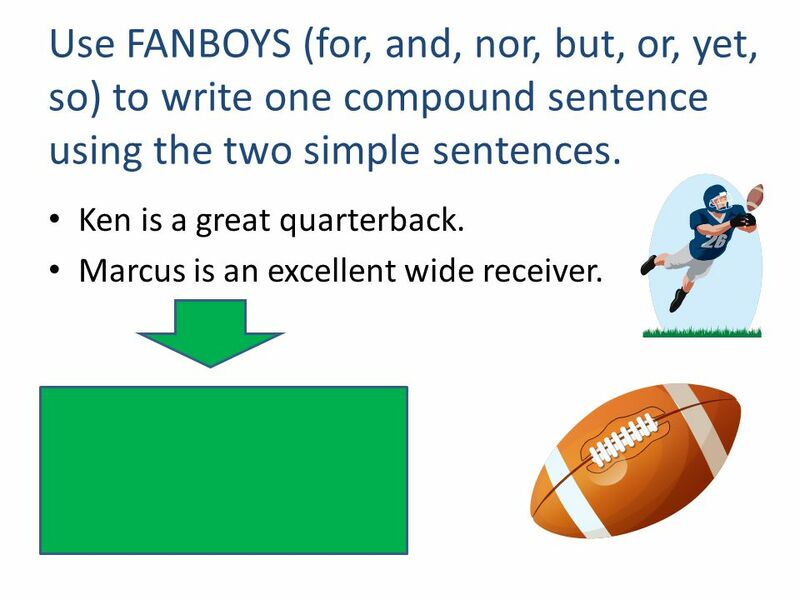 7 Use FANBOYS (for, and, nor, but, or, yet, so) to write one compound sentence using the two simple sentences. The students tried to prepare for the test. They didn't realize how difficult the test was. Did you use but? The students tried to prepare for the test, but they didn’t realize how difficult the test was. 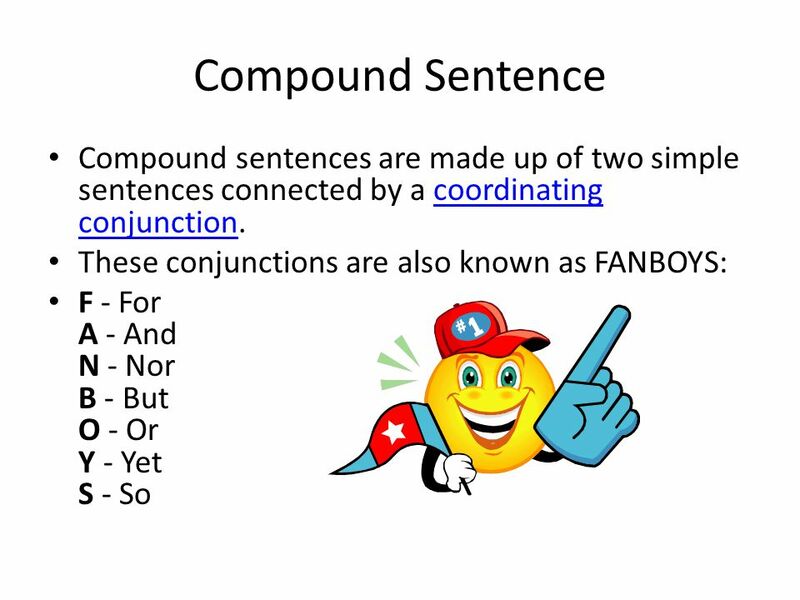 8 Use FANBOYS (for, and, nor, but, or, yet, so) to write one compound sentence using the two simple sentences. Marsha thinks the family should stay home and relax. She also wants to go on vacation. Marsha thinks the family should stay home and relax, but she also wants to go on vacation. 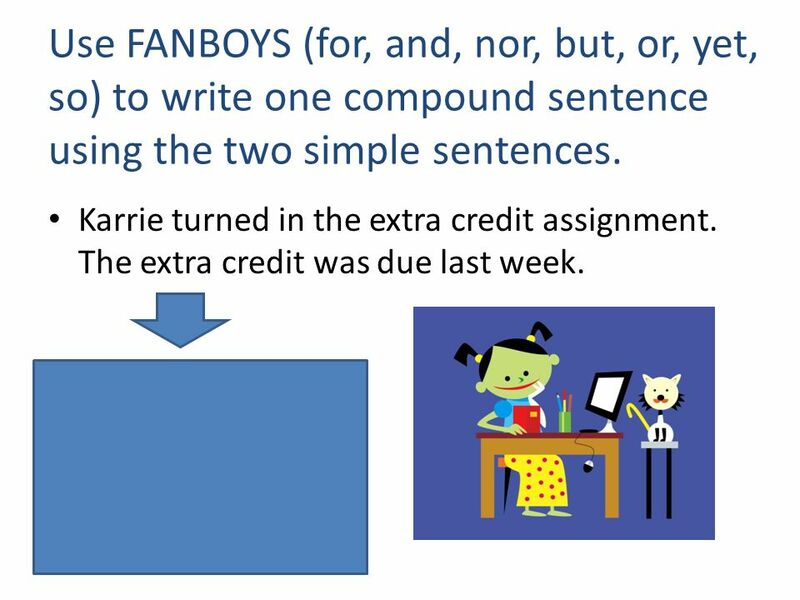 10 Use FANBOYS (for, and, nor, but, or, yet, so) to write one compound sentence using the two simple sentences. Adam asked his teacher for help. He also asked his parents for help. Adam asked his teacher for help, but he also asked his parents for help. 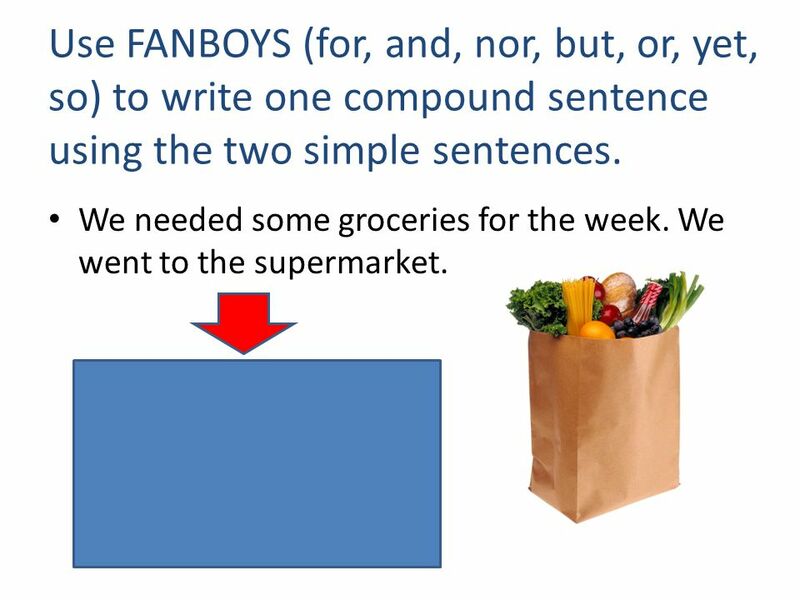 11 Use FANBOYS (for, and, nor, but, or, yet, so) to write one compound sentence using the two simple sentences. Karrie turned in the extra credit assignment. The extra credit was due last week. Karrie turned in the extra credit assignment, but the extra credit was due last week. 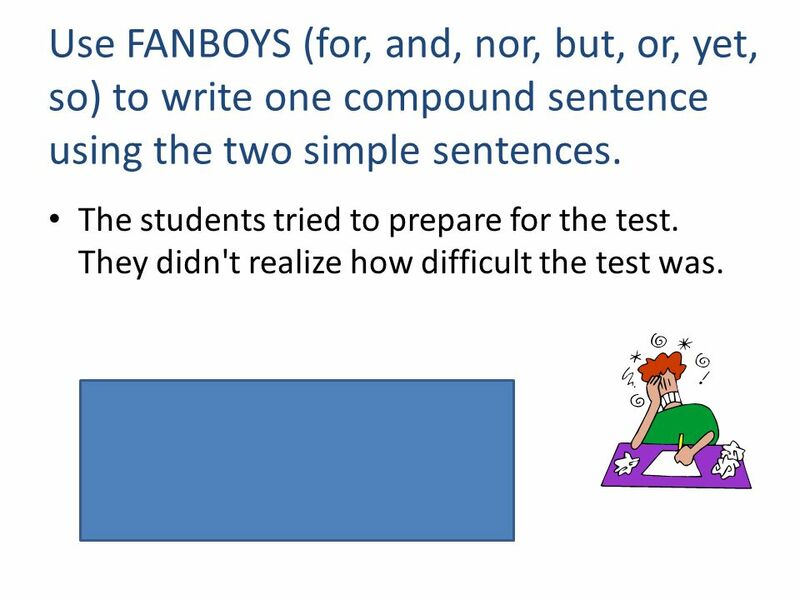 12 Use FANBOYS (for, and, nor, but, or, yet, so) to write one compound sentence using the two simple sentences. Ken is a great quarterback. Marcus is an excellent wide receiver. Ken is a great quarterback, and Marcus is an excellent wide receiver. 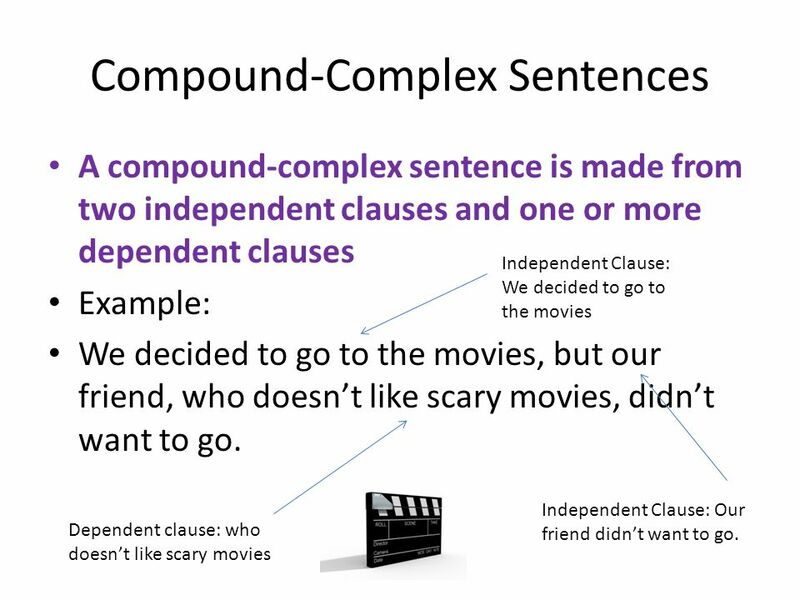 13 Complex Sentence Complex sentences are often formed by putting these words at the beginning of the dependent clause: as, as if, before, after, because, though, even though, while, when, whenever, if, during, as soon as, as long as, since, until, unless, where, and wherever. 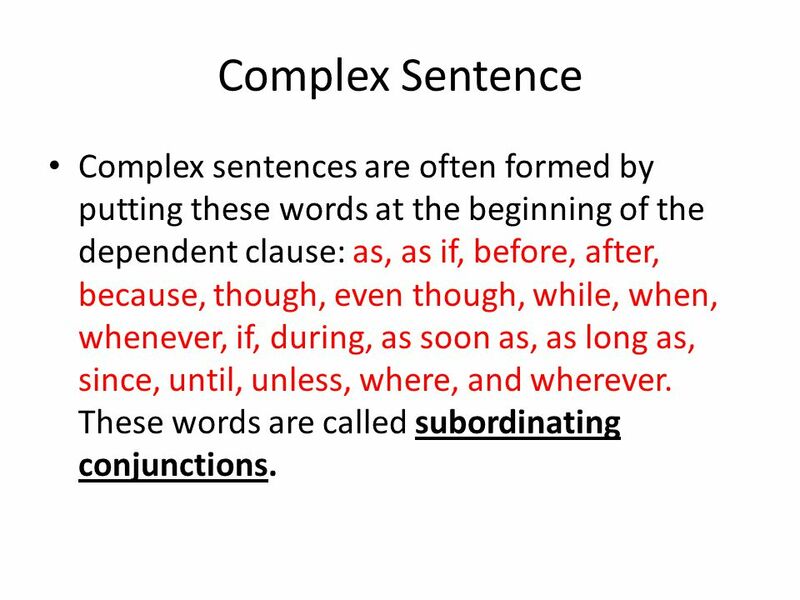 These words are called subordinating conjunctions. 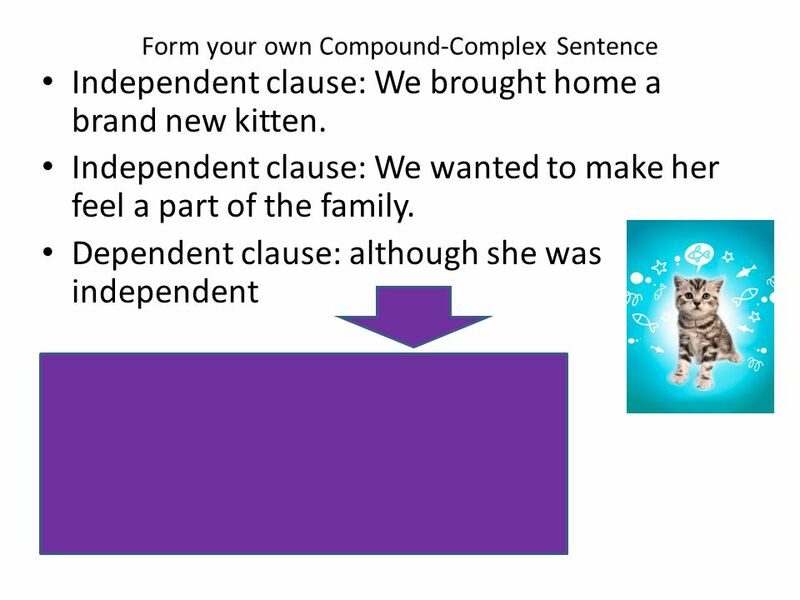 14 A complex sentence is made from an independent clause and a dependent clause joined together. 16 Complex Sentence Now you try to form a complex sentence. 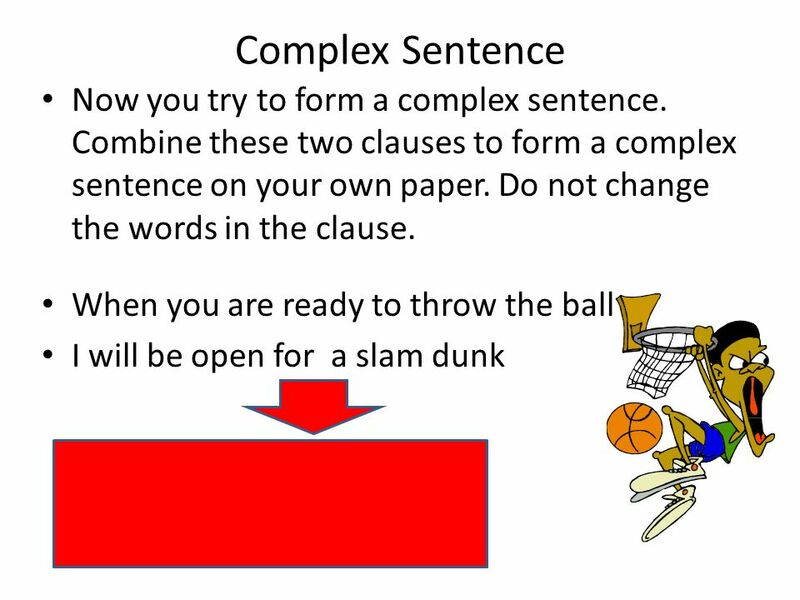 Combine these two clauses to form a complex sentence on your own paper. Do not change the words in the clause. 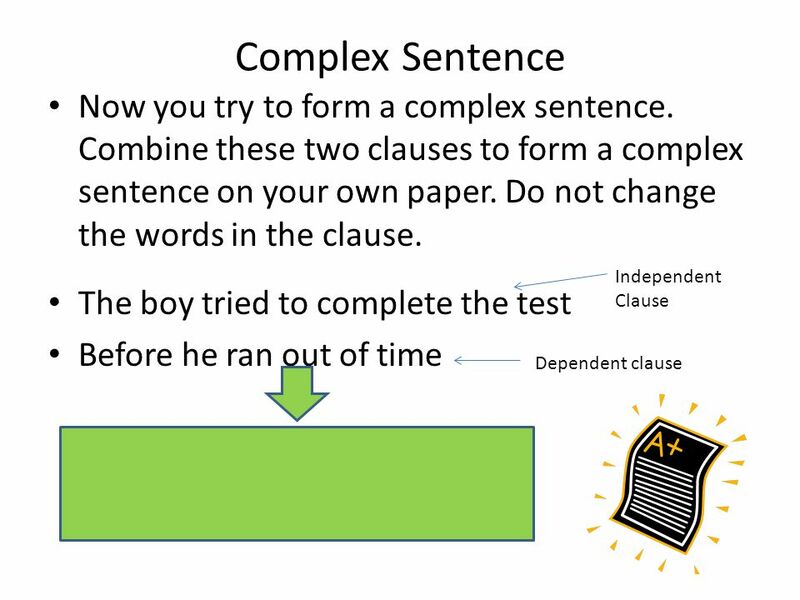 The boy tried to complete the test Before he ran out of time Independent Clause Dependent clause The boy tried to complete the test before he ran out of time. 18 Complex Sentence Now you try to form a complex sentence. 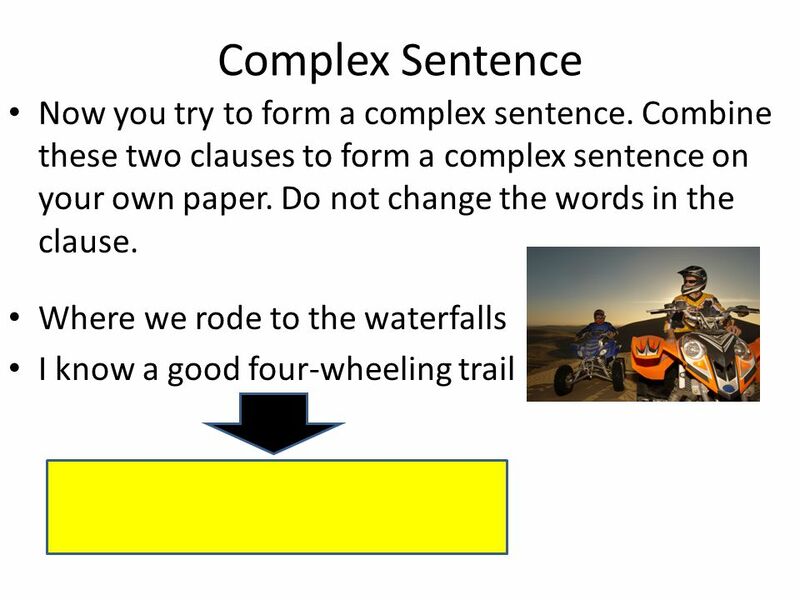 Combine these two clauses to form a complex sentence on your own paper. Do not change the words in the clause. Because we were late for the movie We had to go bowling Friday night Because we were late for the movie, we had to go bowling Friday night. Now you try to form a complex sentence. 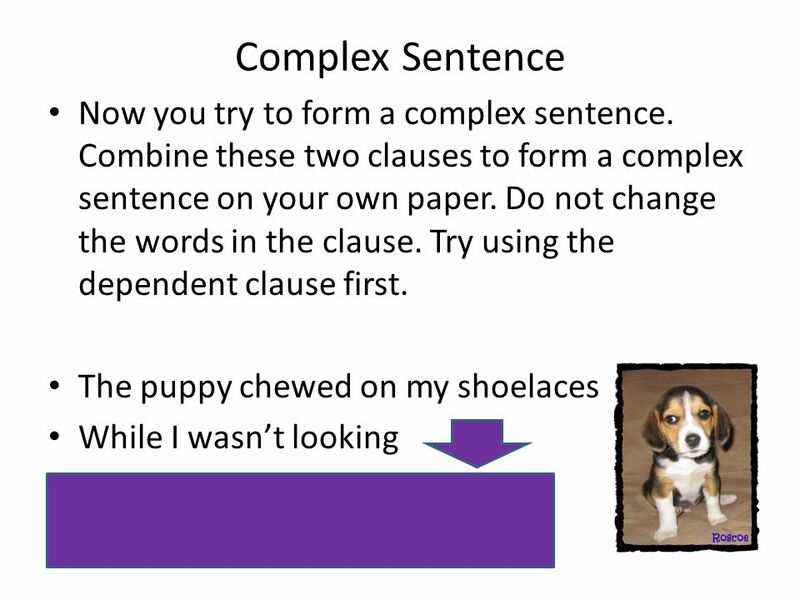 Combine these two clauses to form a complex sentence on your own paper. Do not change the words in the clause. Even though we weren’t ready We had to present the project Even though we weren’t ready, we had to present the project. 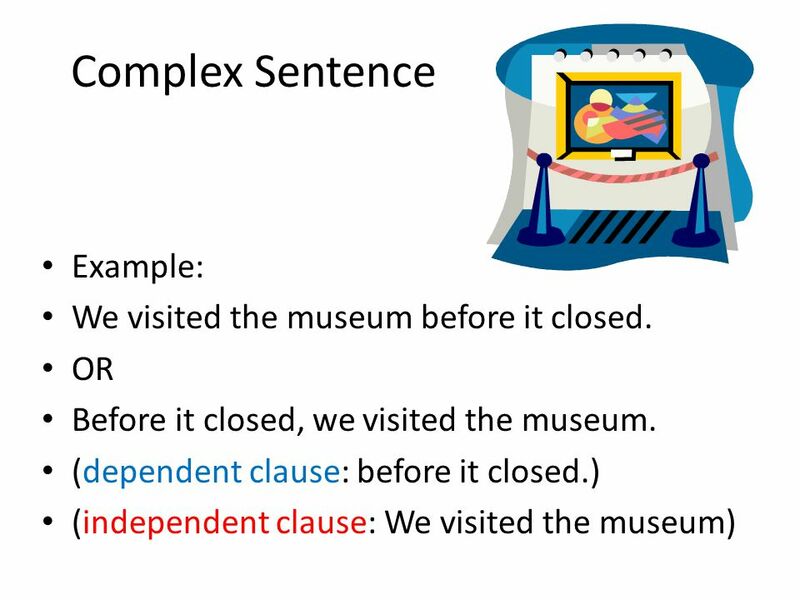 20 Complex Sentence Now you try to form a complex sentence. 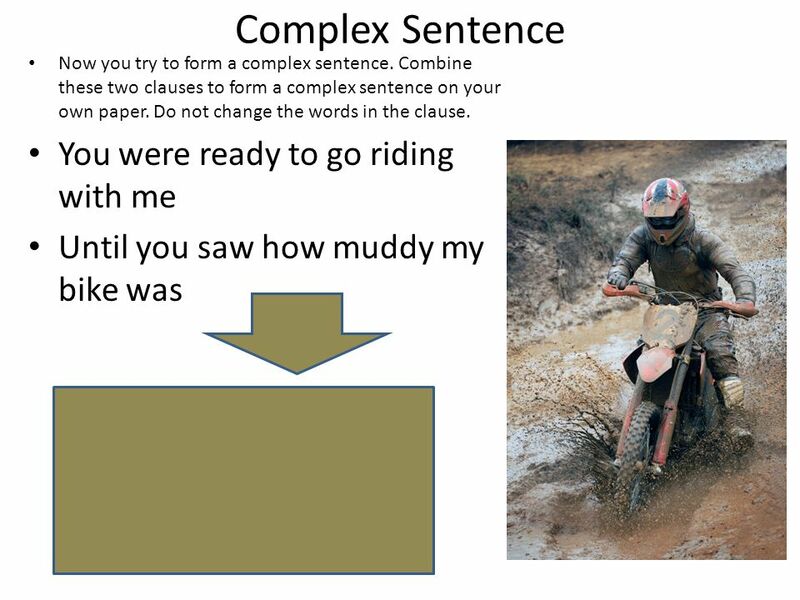 Combine these two clauses to form a complex sentence on your own paper. Do not change the words in the clause. When you are ready to throw the ball I will be open for a slam dunk When you are ready to throw the ball, I will be open for a slam dunk. 21 Complex Sentence Now you try to form a complex sentence. 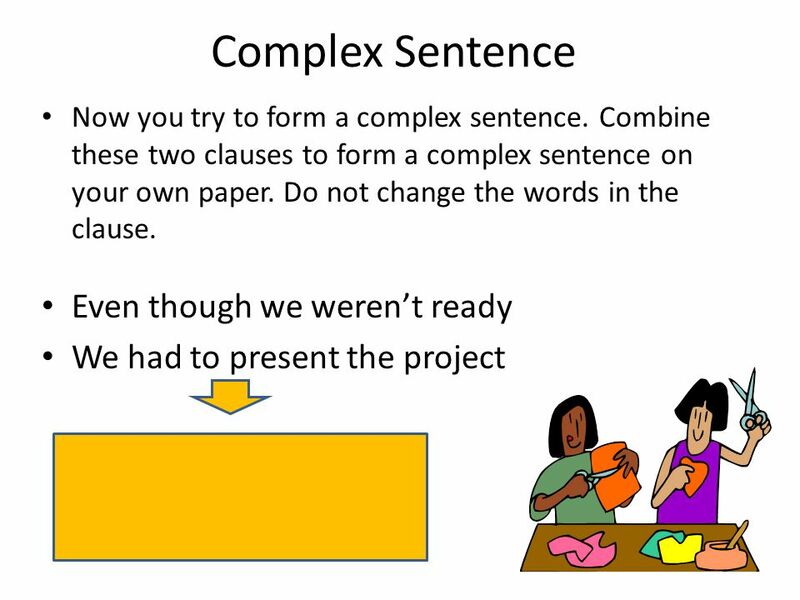 Combine these two clauses to form a complex sentence on your own paper. Do not change the words in the clause. Where we rode to the waterfalls I know a good four-wheeling trail Where we rode to the waterfalls, I know a good four-wheeling trail. 22 Complex Sentence Now you try to form a complex sentence. 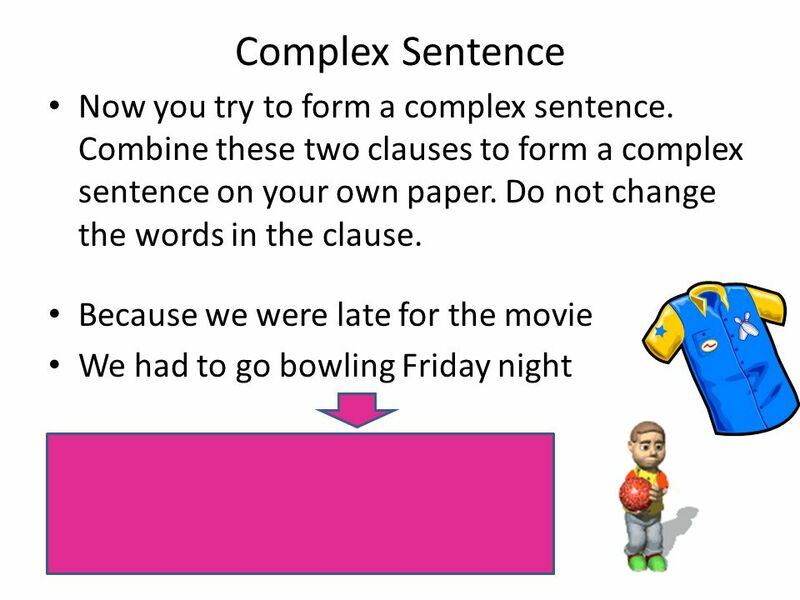 Combine these two clauses to form a complex sentence on your own paper. Do not change the words in the clause. You were ready to go riding with me Until you saw how muddy my bike was You were ready to go riding with me, until you saw how muddy my bike was. Independent clause: We brought home a brand new kitten. Independent clause: We wanted to make her feel a part of the family. Dependent clause: although she was independent We brought home a brand new kitten, and we wanted to make her feel a part of the family, although she was independent. 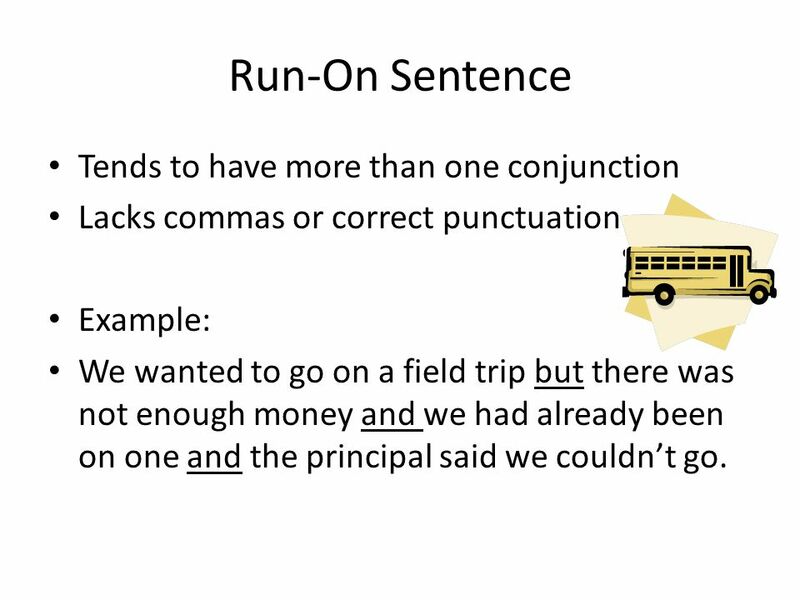 Lacks commas or correct punctuation Example: We wanted to go on a field trip but there was not enough money and we had already been on one and the principal said we couldn’t go. 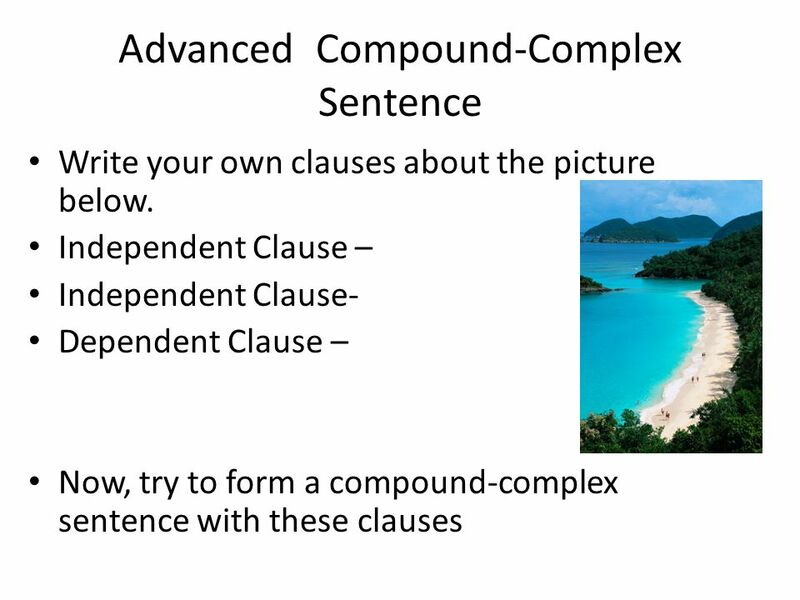 Download ppt "Compound Sentences Complex Sentences Simple Sentence Compound-Complex"
Ever feel like you’re not getting anywhere with your writing??? Sentence Fluency By: Muriel Perez. A run on is a sentence that is actually two sentences combined into one without proper punctuation. 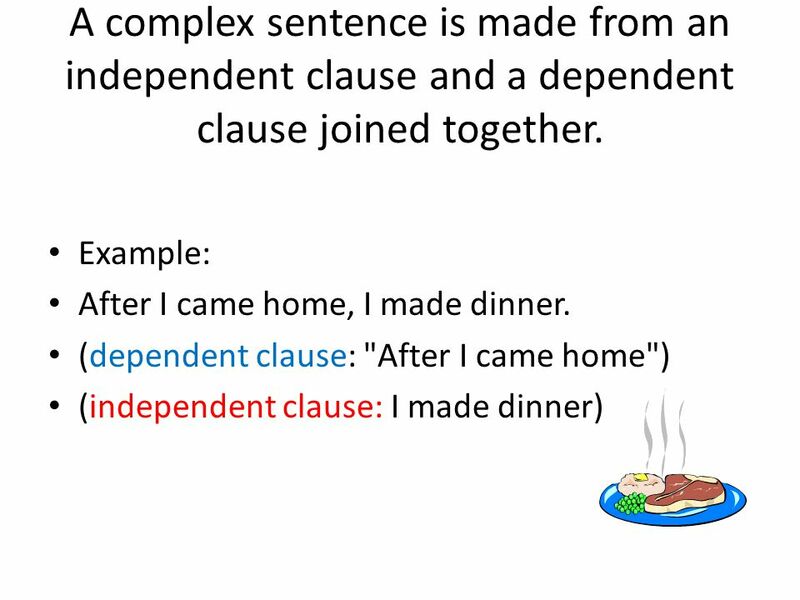 Two or more independent clauses combined without. 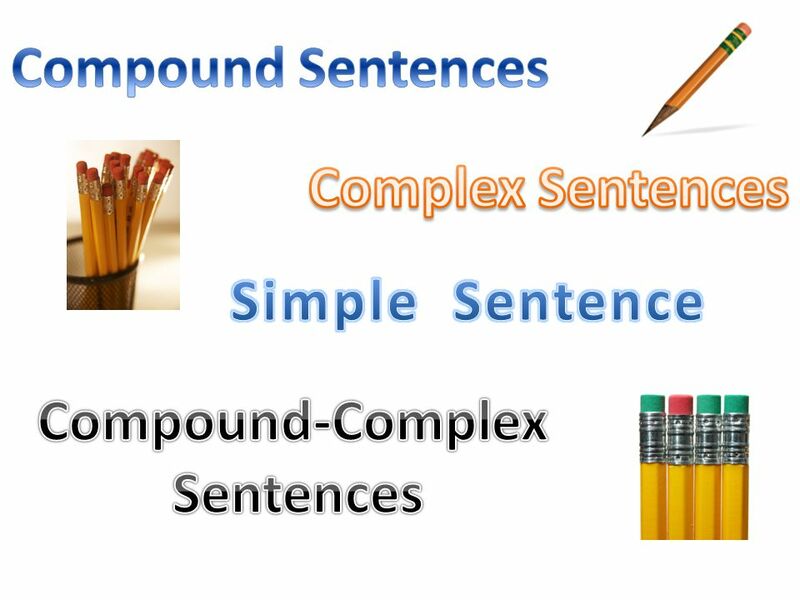 Types of Sentences  Simple  Compound  Complex  Compound- complex. 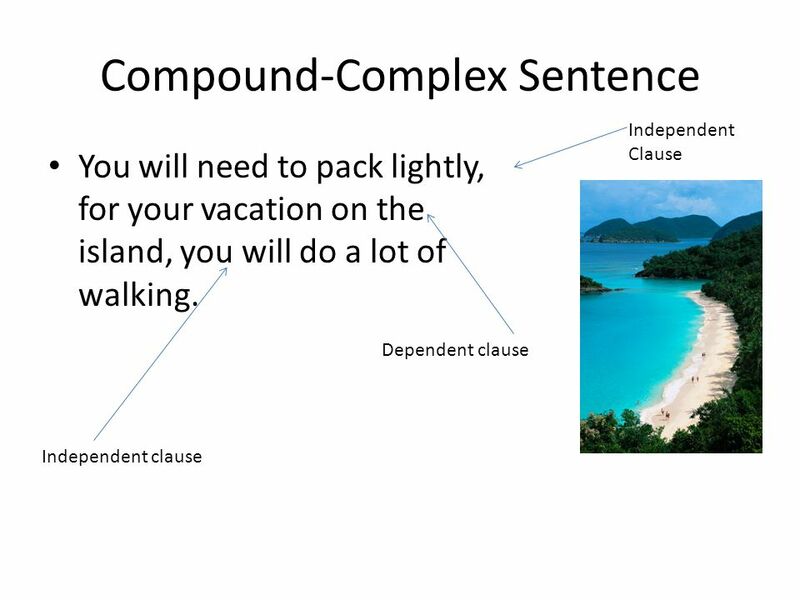 Sentence Structure Common Errors in Composing a sentence. Sentence Structure: Sentence Types. A Sentence... MUST have a subject and a verb (predicate) MUST have a complete thought Also... Begins with a capital. 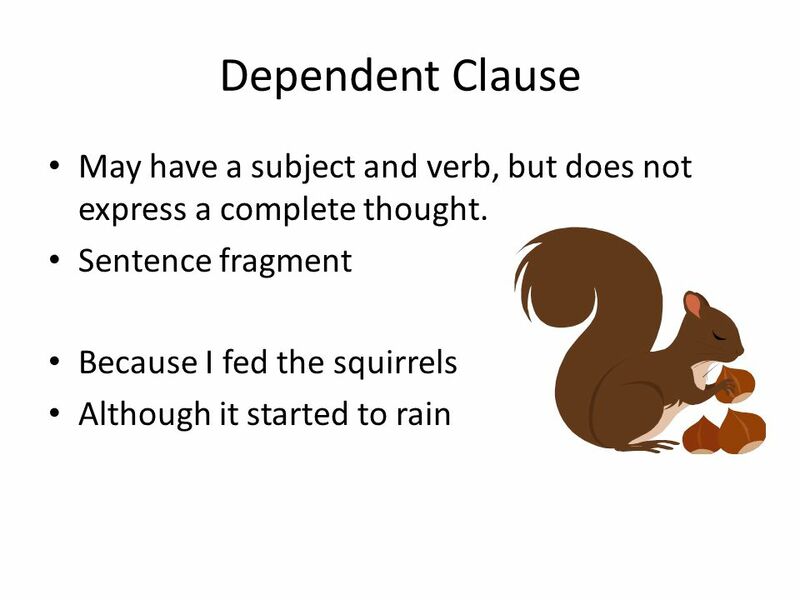 SUBORDINATE CLAUSES. Subordinate Clauses Also known as a dependent clause Fragment, thus cannot stand alone Example: As Joe put ice cream into his cup. Sentence Types. Clause: no, not Santa! A group of words with a subject and a verb. 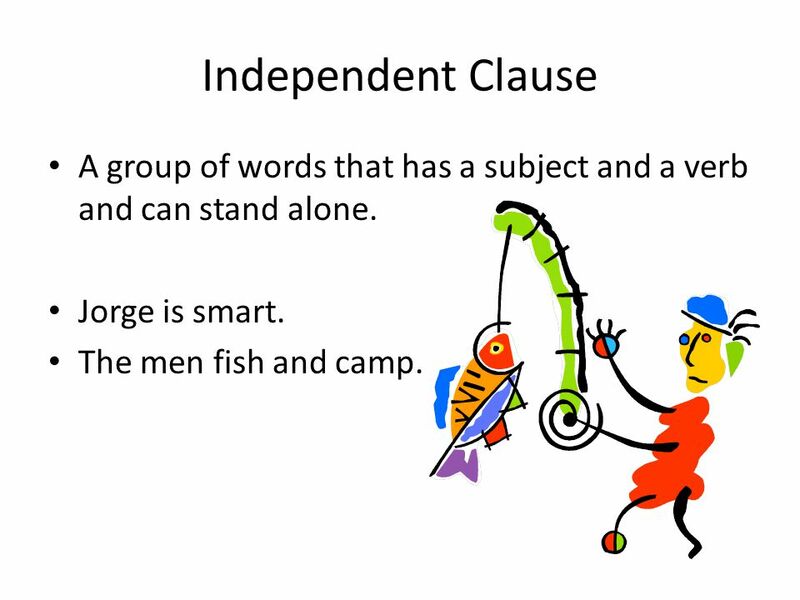 The clause can be independent or dependent.